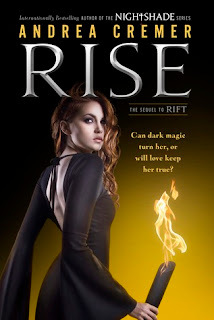 The sequel to Rift and the prequel to the New York Times bestselling novel Nightshade. Everything Conatus stands for is at risk. Hoping to gather enough resistance to save their order, Ember and Barrow attempt a desperate escape. But fate offers little mercy. When their mission is exposed, the couple face relentless pursuit by the supernatural horrors that act on the commands of Eira’s ally: the mysterious Bosque Mar. A shocking revelation forces Ember out of hiding, sending her back into the heart of dark magic at Tearmunn keep, where she must convince her old friend Alistair of her love or face dire consequences. Ember’s deception offers the only chance for the resistance to succeed, but what she discovers in the shadows beneath the keep will shatter her world and bring about the Witches’ War. Richly sensual and full of magic, action and danger, Andrea Cremer's fifth book set in the Nightshade world is an edge-of-your-seat page turner. Im getting into all this blogging thing. I bookmarked your blog, will check it out again. later fellas.